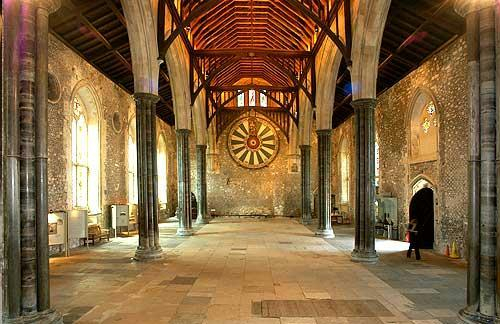 Winchester Great Hall. Built by King Henry III, 1222 to 1235. “King Arthur’s Round Table” hangs on the wall- it was made in the 13th century and repainted during the reign of King Henry VIII. It has become a symbol of Winchester, which was the capital of England until 1066. We opted for the Winchester Great Hall production, instead of the Wanamaker Playhouse. OK, it’s 45 miles drive rather than 110 miles for us, but the main motivation was that the actual trial of Sir Walter Ralegh took place on this same spot exactly 415 years ago today. We were most interested in the concept, production and direction by Oliver Chris, a marvellous actor. My spellchecker is having trouble with RALEGH, but as the Globe website points out, RALEGH was his preferred spelling, and though he varied it, he never spelled it in the way most books do now, as RALEIGH. But that’s the name on the push bikes. Ralegh’s claim to fame in my childhood was that he threw his cloak over a muddy puddle so that Queen Elizabeth I could step on it, circa 1581. There is no historical record that this ever happened. My school had large reproductions of historical paintings with Imperial themes. I passed “The Boyhood of Raleigh” by Millais several times a day. We adapted that as a stage sketch, set up as a TV chat show, adding Columbus with a tomato and a potato and Captain John Smith with Pochahontas (as a starlet with an American accent). No, I do know they were 100 years apart. Back to the historical Ralegh. He fought for the crown in Ireland, was knighted in 1585, was granted a patent to explore and set up a colony in Virginia (named after the Virgin queen herself). He sent others to establish the Roanoke Colony in 1585 and 1587. In 1592 he married the Queen’s lady-in-waiting secretly, much to Her Majesty’s Displeasure, got caught and sent to the Tower of London. On release from prison he became a Member of Parliament (In my opinion the reverse order would suit so many current MPs … I’d have a few Tory backstabbers in the Tower tomorrow). Ralegh sailed to Guinea, seeking the legendary El Dorado. He lived in Sherborne Castle, in what the Daily Telegraph once voted the UK”s most desirable town (it’s good, but not THAT good), and from 1600-1603 was Governor of Jersey. Queen Elizabeth died in March 1603, and King James I (of England, James VI of Scotland) had Ralegh arrested in July for plotting against the king. 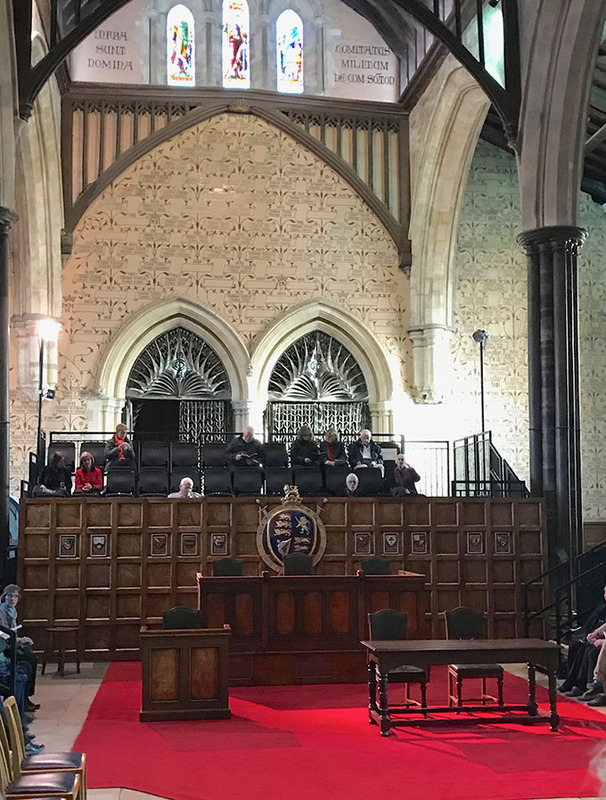 His trial began on 17 November 1603 in Winchester Great Hall and is held up as a famous miscarriage of justice … and this Winchester presentation of the play takes place on 17 November 2018. I had no previous knowledge on the trial, except that there was one. The Great Hall has been set up very much in the shape of the Wanamaker Playhouse, the stage must be about the same. However the audience are on four sides, not three, and the face on section is far larger than the side sections. With a courtroom backdrop cutting off the rear area, it worked extraordinarily well as a substitute Wanamaker- so much so that they should consider taking some “normal” productions there. They warned us it’d be cold – not too bad. The seats are tight on leg room and low, but hey, we’re comparing it to the Wanamaker’s benches. It’s OK. No reserved seating, so we arrived 30 minutes early and it was already half full. It’s being done in modern dress, and members of the public could volunteer to be the jury who will decide on the day. I wondered about that given that we have the actual location. The Elizabethans and Jacobeans had spies everywhere. I bet there was one on the original jury. Probably someone from the production on this one. The modern dress worked, as did gender switches mainly … female clerk of the court, female central judge and both prosecuting attorneys. In modern dress it was fine (I will say it would have seemed wrong in Jacobean dress, or worse, Globe dressing up box dress.) Howard and Cecil were ‘smart casual’ contrasting with the officials’ formal dress and Ralegh’s smart suit, highly polished shoes, stately bearing and single pearl earring. I think they could have been more formal, as they looked rural magistrate rather than crown court, but I guess they were supposed to contrast strongly with Ralegh. The programme is very good indeed, pairing each actor’s photo with an original painting of the character. Simon Paisley Day looks very like Ralegh. The best is Fiona Hampton as Heale (the first prosecutor). Her original has his hand on his ear on a tomb carving, so she reproduces it with a mobile phone to her ear. 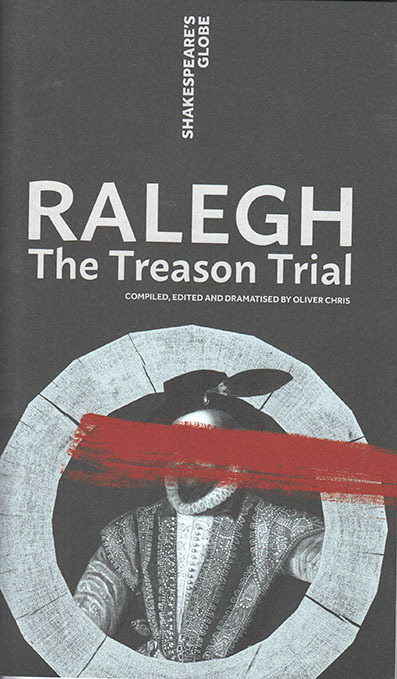 There’s good bio on Ralegh in the programme, noting that he was 6 foot tall (highly unusual in 1603). He was an accomplished poet, the Queen’s favourite, a swordsman, rich, renowned for his wit and was a war hero. He was also arrogant. The women prosecutors gave great performances, going for impassioned. I loved the almost tearful references from Heale to the King’s poor little threatened babes – clearly “lawyer over-acting” which is what was done in the original trial. The trouble with the plot is simple. As a parent / teacher, I have so often had to deal with “He said I did it. I didn’t do it.” The trial never gets beyond this. They declined to call Lord Cobham (he said Ralegh did it) as a witness. It’s why the original trial was a travesty, but it does not lend itself to drama. The repeated accusation (Cobam says you’re a traitor / No, I am not), and repeated vehement denial were ultimately boring. When we eventually get the very short cameo of Jay Varsani as a witness, Dyer (reporting on events in Lisbon), it was such welcome comic relief. Afterwards we both felt there was a missed opportunity. If they’d cast a shorter, less attractive, jealous sneering male as lawyer against Ralegh, there would have been a different kind of gloat, and more tension. Day did wonderful angered stares at his accuser, Coke (Nathalie Armin). She fully deserved her applause for a magnificent performance as the Attorney General, but the whole inevitably fell foul of the Globe’s 2018 knee-jerk 50/50 gender casting. Blame the Artistic Director. Given a male opponent, Ralegh would have fully conveyed and made more of exuding the “if I’m found not guilty, try repeating that outside court!” (aka the Irish … ‘You’re dead!’) which Day was giving with enormous power. There would have been a male-male dynamic. Day exuded his fury so well … but it doesn’t work against a woman. Great acting from her. But you could have cast a short, nasty, sneering, jealous male who was nowhere near as good as her at delivering the lines, and it would have worked better for the play. Misguided gender-blind casting. It’s not just the quality of the acting, but also … OK, type-casting. You get a 15 minute break while the jury deliberate. Good for a necessary leg stretch. Are there alternative endings depending on the jury? No, I very much doubt it- the ending with Ralegh’s poem seemed too good, the death sentence so resounding and vicious, and it is what happened. It was a privilege to be there on this day and to see 5 star acting performances in a wonderful setting. It exuded REAL. Sadly what was real was too repetitive. We needed a touch of Perry Mason / LA Law written and fictional courtroom drama. Parking in Winchester- £15 for over 4 hours.Parking in Chichester, which is not far away? £4.60 for over 4 hours. Might be this part of the reason Chichester Festival Theatre is packed / sold out … and Winchester Theatre Royal seems nearly empty?